New! Chicken breast fritters with creamy mashed potatoes topped with savory homestyle gravy, corn and shredded chicken. 19 g protein. Per 1 Bowl: 450 calories; 6 g sat fat (30% DV); 1380 mg sodium (60% DV); 3 g total sugars. Inspected for wholesomeness by US Department of Agriculture. Since 1953. Meals made mega. Battered white meat chicken. Mashed potatoes + gravy. Sprinkled with corn + mozzarella cheese. how2recycle.info. SmartLabel. Scan for more food information. Questions or comments, visit us at www.banquet.com or call Mon.-Fri., 1-800-257-5191 (except national holidays). Please have entire package available when you call so we may gather information off the label. Proudly made in the USA. 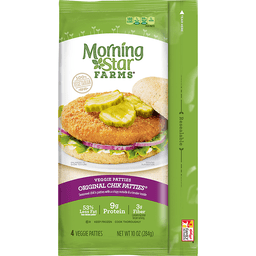 Morning Star Farms® Original Chik Patties®. New resealable pack. Same amount of food. Per patty: 160 calories. 1g sat fat, 5% DV. 320mg sodium, 13% DV. 2g sugars. 100% vegetarian. Seasoned chik'n patties with a crispy outside & a tender inside. 53% less fat than chicken patties*. 9g protein. 3g fiber. Contains 6g total fat per serving. Veggie patties. Discover delicious meal ideas at morningstarfarms.com. Multi-layer bag. how2recycle.info. *Chicken patties contain 14g total fat per serving (71g). Morning Star Farms® Original Chick Patties® contain 6g total fat per serving (71g). Questions or comments Visit: morningstarfarms.com. Call: 1-800-962-0120. Provide production code on package. ®, TM, ©2015 Kellogg NA Co.
America's original veggie burger with 7 delicious vegetables. 100% vegetarian. 74% less fat than regular ground beef (Regular ground beef contains 15 g total fat per serving [67 g]. 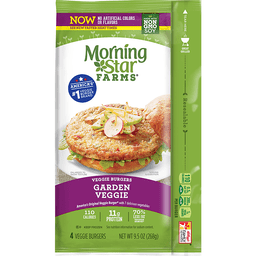 MorningStar Farms Garden Veggie Burgers contain 3.5 g total fat per serving [67 g]). 10 g protein. 3 g fiber. Contains 3.5 g total fat per serving. Per 1 Burger: 110 calories; 0.5 g sat fat (3% DV); 350 mg sodium (15% DV); 1 g sugars. Kellogg's Family Rewards. Provides 19% of the daily recommended amount of complete protein. Complete protein contains all nine essential amino acids in the recommended amounts per gram of protein. Find out more about complete protein and discover delicious meal ideas at morningstarfarms.com. Produced with genetic engineering. how2recycle.info. Questions or comments: Visit: morningstarfarms.com. Call: 1-800-962-0120. Provide production code on package. Whole grain breaded chicken breast patties. Made with white meat. Full cooked. 0 g trans fat per serving. Inspected for wholesomeness by US Department of Agriculture. Great taste & whole grain goodness. Different bag, same amount of chicken. Resealable. So good for so little. 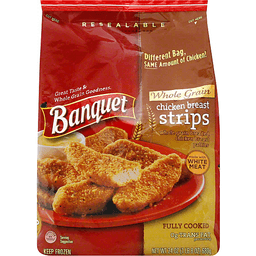 Banquet Whole Grain Chicken Breast Strips are packed with 8 tasty grams of whole grains. Yup, they give your family the good stuff that tastes great. Now if that's not so good for so little, someone tell us what is. 100% Whole Grain: 8 g or more per serving - WholeGrainsCouncil.org. All natural (No artificial ingredients, minimally processed). Without giblets. Contains less than 4% retained water. Inspected for wholesomeness by US Department of Agriculture. Tyson tested for quality. We guarantee this product to meet our highest quality standards. If you're not completely satisfied, we will promptly replace it (proof of purchase required). In Touch with Tyson: 800-233-6332. Your questions or comments are important. Call Monday-Friday, 8 am - 5 pm CT. www.tyson.com. 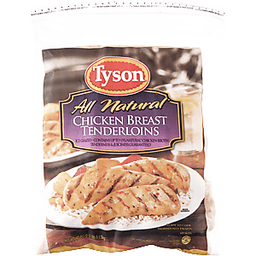 For great recipes, food tips, information about our products and Tyson core values visit us on the internet. Or write Tyson Foods, Inc., PO Box 2020, Springdale, AR 72765-2020 USA. Thank you for buying this Tyson product. Htchd, raisd, hrvstd-USA. Nugget shaped chicken breast patties with rib meat-fritters. Made with white meat. Microwave in minutes! 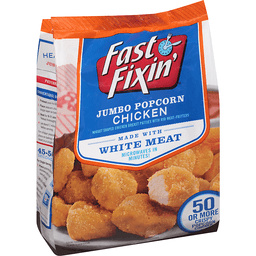 50 or more crispy popcorn chicken. Inspected for wholesomeness by US Department of Agriculture. Fully cooked. Get Your Coupons & Recipes: FastFixin.com. Join the Fast Fixin' community. Facebook. Twitter. Pinterest. More taste on your plate - more money in your pocket. Our new, better-tasting recipe is made with white-mean chicken, delicious new seasonings and crispy, crunchy breading. One thing we didn't change: the price. 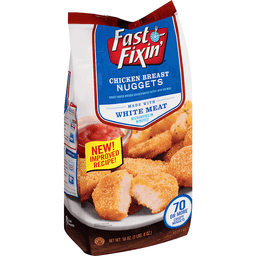 Fast Fixin' still gives you a delicious meal at a price that fits into your family's budget. Our Quality Promise: We promise that the outstanding quality and great taste of this product will perform to your expectations or your money back. 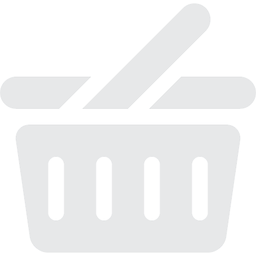 Please share your comments with us at: AdvancePierre Foods, Inc. 9990 Princeton-Glendale Rd. Cincinnati, Ohio 45246. Attn: Consumer Affairs, Phone: 877.447.3279. Or visit our website at www.fastfixin.com. Chicken breast fritters with rib meat, coated in a honey barbecue sauce. Easy prep. Heat & eat. Inspected for wholesomeness by US Department of Agriculture. Questions or Comments? Call 1-800-457-9810, Monday - Friday. Please have packaging available when calling. 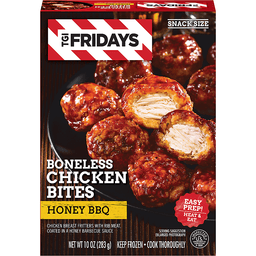 To learn more about TGI Friday's frozen snacks, visit www.fridaysinyourfreezer.com. 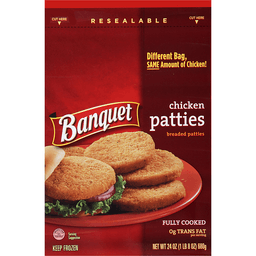 Banquet® Chicken Patties. Since 1953. Breaded chicken patties. Made with drum & thigh meat. 0g Trans fat per serving. Per 1 patty: 160 Calories. 1.5g sat fat, 8% DV. 340mg Sodium, 14% DV. 1g Sugars. Fully cooked. Inspected for wholesomeness by U.S. Department of Agriculture. Net Wt 24 oz (1 lb 8 oz) 680 g. Conagra® Foods - Food you love. 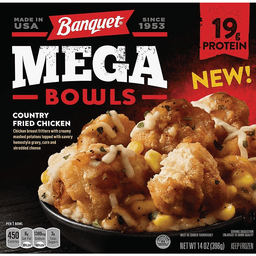 For over 60 years, Banquet® has been making delicious food the whole family loves. So, it's no surprise that these Chicken Patties are perfect for anyone to enjoy any time. Please have entire package available when you call so we may gather information off the label. Questions or Comments, Call 1-800-257-5191 Mon.-Fri., 9:00 AM-7:00 PM (CST) (except national holidays) or Visit us at www.banquet.com. Fritters with rib meat. Made with white meat chicken. Resealable for freshness. New & improved! 100% all natural (Minimally processed. No artificial ingredients) ingredients. Fully cooked portioned. No preservatives. 0 g trans fat per serving. Inspected for wholesomeness by US Department of Agriculture. Project A+. Support your school! See back for details. 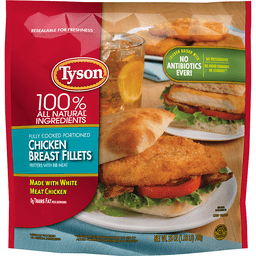 Tyson Tested for Quality: We guarantee this product to meet our highest quality standards. If you're not completely satisfied, we will promptly replace it (proof of purchase required). In Touch with Tyson: 800-233-6332. Your questions or comments are important. Call Monday-Friday, 8 am-5 pm CST. www.tyson.com. 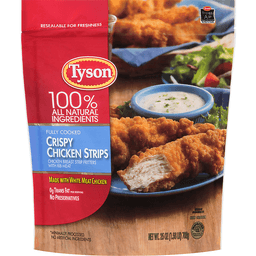 For great recipes, food tips, information about our products and Tyson Core Values visit us on the internet. 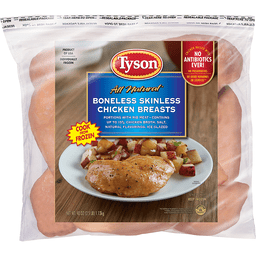 Or Write: Tyson Foods, Inc., PO Box 2020, Springdale, AR 72765-2020 USA. 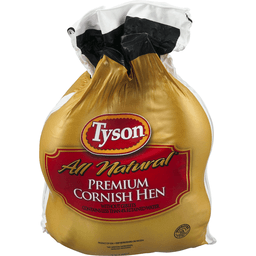 Thank you for buying this Tyson product. Clip this Tyson Project A+ section and turn it in at your school. Each clipping collected by your school is redeemable for cash. Details for the Tyson Project A+ program and how your school can participate are at ProjectAplus.tyson.com or 800-233-6332.